Wet conditions expected next few days across PEI..
Wednesday, October 31st 6:40am.. Clouds and showers continues this morning across eastern PEI associated with a cold front moving east of Cape Breton. This activity should end this morning as the front moves further away and we may even see some sunny breaks as a weak ridge of high pressure crests over the island. Clouds and showers return tonight as a warm front approaches front the SW. 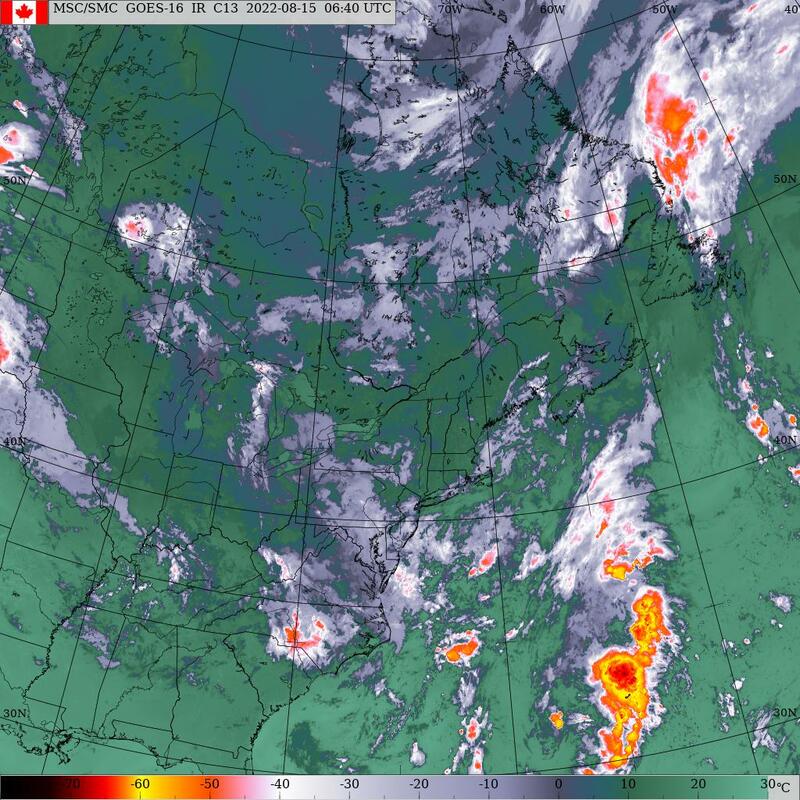 This frontal system will then stall oriented in a NE-SW fashion across the Maritimes maintaining cloud and rain for the region for the next few days. A couple of waves of low pressure will then ripple NE from the American mid west crossing the region on Friday and again on Saturday/Saturday night. These systems will enhance rainfall which could approach warning criteria. The front finally sweeps across the island near dawn on Sunday morning a s the last in the series of weatehr disturbances moves NE toward Labrador. Skies begin to clear on Sunday as a large area of high pressure builds in from Ontario. This feature will crest over the island on Monday with sunshine and calm winds but temps will be cooler. Unsettled weather returns on Tuesday as a system lasses by to our south. Will need to watch this for a further north track otherwise high pressure continues to dominate. Wednesday will see a powerful area of low pressure passing to out west through Ontario which will spread cloud, rain and wind into the Maritimes. Precipitation.. Left over showers moving off eastern PEI this morning. Showers return near midnight tonight and continue through tomorrow morning tapering off through tomorrow afternoon as the front sinks south of the island. Rain at times heavy develops Friday noonish as the 1st wave of low pressure approaches tapering back to showers by early evening giving 20 mms. Rain redevelops by dawn on Saturday becoming heavy at times ending near dawn on Sunday morning. Rainfall amounts for this 2nd system could be as high as 30 mms. Dry weather for Sunday morning through Wednesday evening but need to watch that ocean disturbance for Tuesday for any northward shift. More rain by Wednesday night as that powerful system in Ontario approaches. Temperatures.. near normal next few days. Well above normal on Saturday cooling back to normal-slightly below normal Sunday through Wednesday. Wind.. Light NW winds today shifting to SW tomorrow then back to the north on Friday. Winds shift back to the south again on Saturday then increase to brisk0-strnog southerly Saturday night shifting to NW near dawn Sunday morning. Hazards.. Wet driving conditions in left over showers this morning then redevelop tonight and continue through Sunday morning. Heavy rain potential for Friday through Sunday morning with rain possibly approaching warning criteria. Winds will also be a concern Saturday night which may cause bridge restrictions. Plan accordingly if driving high sided vehicle Saturday night across the bridge. Watches/warnings... None for PEI at this time. Tonight.. Cloudy with showers developing towards midnight, calm winds, lows 4 by midnight then slowly rising towards dawn. More showers expected today across PEI..
Tuesday, October 30th 6:30am.. A broad area of low pressure is moving across the Maritimes today with cloud and showers. Tomorrow morning will see a weak ridge of high pressure approach from the west and is expected to crest over the island tomorrow afternoon. We should some sunshine with this feature. Clouds thicken up quickly Wednesday evening as a frontal system approaches with showers developing near midnight. The frontal system will then stall and be draped in a NE-SW fashion expected from Newfoundland all the back through the American mid west. Clouds and showers will accompany this feature. Several waves of low pressure will then ripple NE along the frontal boundary across the region enhancing rainfall which occurs Friday nigh and again on Saturday night. The front finally sweeps eastward by Sunday afternoon and should allow for clearing skies unfortunately will also bring an end to the mild temperatures. High pressure builds in and dominates for Monday and Tuesday with some sunshine. Clouds and showers late Wednesday as another cold front moves through. Precipitation… Chance of showers today and this evening with a drying trend toward dawn tomorrow. Wednesday should be dry but more showers expected just after midnight. These periods of rain or showers continue all day Thursday, Friday Saturday ending Sunday morning. The rain will be heavy at times Friday evening and Saturday night with significant amounts possible. Dry Sunday afternoon through Wednesday afternoon. Temperatures.. Mild again today, slightly cooler tomorrow then normal on Thursday. Above normal Friday through Sunday morning. Cooler air invades Sunday and continues into Monday, normal again on Tuesday. Wind.. Light southerly now will shift to northerly this afternoon which continue through tomorrow. Light southerlies again on Thursday. Halloween.. Generally cloudy skies, slight chance of a shower late, light NW winds and early evening temps near 6. Hazards.. Wet driving conditions in showers today. Watches/warnings. None for PEI at this time. Sunday.. Morning cloud and rain, clearing through the afternoon, brisk-strong south winds, shifting to NW, temps 16 which occur in the morning then falling through the afternoon with the NW winds. More rain expected tonight across PEI..
Monday, October 29th 6:00am.. A trough of low pressure oriented N-S located just east of Cape Breton continues to give rain to eastern Cape Breton this morning. This feature is slowly moving off to the east but a few showers could linger across the island. Some sunny breaks possible today but clouds will be quick to move back as another low pressure system approaches from the south. This system develops near Cape Cod near noon today noon today and moves NE crossing Maritimes overnight tonight. More rain will accompany this system beginning this evening and continuing off and on all day tomorrow. High pressure briefly build sin for Wednesday with some sunshine especially early. Clouds return during the afternoon as a frontal boundary sets up in a NE-SW fashion which extends from the Gulf of Mexico all the way up to the Canadian Maritimes. This feature will be stationary in this location until Sunday night. A couple of waves of low pressure will develop along the front and ripple NE right into the Maritimes enhancing rainfall. This will occur Thursday night into Friday morning then again Saturday night into Sunday afternoon. High pressure will build in for Monday and Tuesday with some sunshine. Precipitation.. Left over showers this morning especially down east where a couple of more mms possible. Rain redevelops this evening tapering back to showers before dawn tomorrow giving another 10 mms. Cloudy with a few showers possible through the day tomorrow. Wednesday looking not too bad with increasing chance of showers towards evening. An extended period of wet weather begins Late Wednesday night and continues through Sunday afternoon. Enhanced rainfall expected Friday then again Saturday night into Sunday afternoon. Hard to give amounts as this will be dependent on the exact position of the frontal trough and the eventual track of the waves of low pressure as they track through but the 4 day total could be significant. Temperatures.. Remaining above normal today, cools down to normal tomorrow then slightly below normal for Wednesday. At or above normal Thursday through Sunday. Cool down begins Monday. Wind.. Light SW winds, today, calm tonight then NW tomorrow and Wednesday. Light southerlies on Thursday increasing to brisk-strong on Friday shifting to NE on Saturday and Sunday. Halloween.. Looking cloudy with slight chance of showers. Light SW-W winds and early evening temps near 6. Hazards.. Wet driving conditions in showers this morning then again tonight. The wet stormy weather continues across PEI..
Precipitation.. Generally 25-35 mms rain fell across the island overnight. In some places the rain briefly began as snow and ice pellets as was the case here in the Emyvale area. Rain has tapered to showers and drizzle now which should continue today and tonight. We could see some sunny breaks between systems tomorrow but rain expected tomorrow night as the second low pressure system moves through. Dry Tuesday afternoon through Wednesday afternoon. Showers expected Wednesday evening as the cold front approaches which continue into Thursday as the front stalls. Showers or periods of rain for Friday Saturday and Sunday as the next couple or low pressure system move through. Temperatures.. Will climb today peaking 15 mid afternoon then slowly fall back. Warm night tonight. Not quite as warm tomorrow but still above normal. Normal for Tuesday Wednesday and Thursday. Another warm day in Friday. Wind.. Brisk SE winds peaking near noon today then diminishing to light southerly tonight and tomorrow hence the mild air. Winds shift to the NW Tuesday afternoon and continue through Wednesday. Light westerlies on Thursday. Brisk-strong southerlies on Friday. Halloween.. Right now looking not too bad.. Cloudy with slight chance of showers. Light SW winds with early evening temperatures near 7. Hazards.. Wet driving conditions in rain..
More rain begins this evening across PEI..
Saturday, October 27th 8:20am.. A ridge of high pressure oriented East-West is currently cresting over the island and will drift off to the east later today. Clear skies and calm winds are accompanying this feature. Clouds will invade the island later this morning as the next system approaches. This system is an area of low pressure currently organizing off the US mid Atlantic coast vicinity Cape Hatteras. This low will intensify and track NE along the coast to about NYC just after midnight tonight then turn northward and begin to weaken as it tracks inland into eastern Quebec by early tomorrow evening. A secondary are of low pressure then develops near NYC Monday morning and tracks NE across the Maritimes MOnday night into Tuesday morning then moves into the Gulf by later Tuesday morning. A significant rainfall threat exist as a result of these 2 systems. It will also be quite windy especially with the first system tomorrow. Skies will begin to clear Tuesday afternoon as high pressure briefly approaches and is expected to crest across the island Tuesday night. Cloud will once again spread across the island Wednesday morning as a cold front approached front the west. The front will lie south of the Maritimes early Thursday morning then begin to lift northward again as a warm front later Thursday bring more rain. The front will then stall across the region and allow several low pressure systems to ripple NE along this stalled frontal boundary across the Maritimes for Friday Saturday and Sunday. So a wet stormy but rather mild week of weather ahead for the island. Precipitation.. Precipitation will start this evening across PEI and could even begin as some snow before changing quickly to rain. The best chance of this will be up west. The rain becomes heavy at times and continues all day tomorrow. Could be a brief break between late tomorrow night and Monday afternoon then rain redevelops later Monday ending before dawn Tuesday morning. Total rainfall in the 40-50 mm range with 30-40 falling with the first system and another 10 mms with second. Dry for Tuesday. Slight chance of showers on Wednesday with the cold front. Rain redevelops later Thursday as the front returns then looking at rain for Friday Saturday and Sunday as several areas of low pressure move through over the weekend. Temperatures.. Today should be the last cool day until late next weekend. Temps will be mild especially Sunday afternoon through MOnday morning then again next Friday. Wind.. Calm winds this morning will become light easterly this afternoon increasing to brisk-strong tonight peaking near noon tomorrow then diminishing to light SE by tomorrow night. Light-brisk SW on Monday shifting to NW on Tuesday, westerly on Wednesday and Thursday. Hazards.. Wet driving conditions in rain beginning this evening and lasting through Tuesday morning with a significant rainfall threat. There could be restrictions on the Confederation Bridge beginning early tomorrow morning through the mid afternoon. Watches/warnings.. Special weather statement still in effect for a significant rainfall threat beginning tonight. Tonight.. Rain beginning mid evening,could begin as snow up west. Winds further increasing to brisk easterly by dawn, temps steady near 4 then rising slowly overnight. More rain expected Saturday night into Sunday across PEI..
Friday, October 26th 8:25am.. An area of low pressure that crossed the island yesterday morning is now located over the northern Gulf and continues to drift away to the north. A ridge of high pressure oriented NW-SE stretches from Hudson’s Bay through the New England coast. This feature will also drift eastward and will crest over the island tomorrow noonish. Brisk west winds between these 2 systems will diminish to clam as thew ridge crests over the island. C;ids will begin to invade the region tomorrow afternoon ahead of the next weather system approaching from the US mid Atlantic coast. This system is actually the remnants of tropical system Willa which impacted the west coast of Mexico a few days ago. This system is now located in southern Alabama and is expected to move NE to be vicinity Cape Hatteras overnight tonight then track Northward along the US east coast to southern New England early Sunday morning. The storm will then turn northward moving inland through New Hampshire passing into eastern Quebec Sunday afternoon. Rain, mild temperatures and windy conditions are expected across PEI from this system beginning Saturday evening. Another weaker system will track from southern New England to NS on Monday afternoon/evening maintaining wet conditions. Skies begin to clear out on Tuesday as high pressure passes south of the Maritimes. More clouds and showers on Wednesday as a frontal system approaches from Quebec. Some sunshine on Thursday s high pressure move across. Clouds and rain return later Friday into Saturday. Precipitation.. Could still be a flurrie or 2 down east. Significant rain event begins tomorrow mid/late evening and continues all day Sunday ending Monday morning with amounts with possible amounts in the 30-50 mm range. Still some uncertainty with these amounts as the exact storm track is still unclear. More showers Monday evening as that 2nd system passes. Mostly dry Tuesday then more rain on Wednesday, dry on Thursday. Rain begins late Friday and extends into Saturday. Temperatures.. Cool today and Tomorrow. Warm-up for Sunday and Monday. Slightly below normal for Tuesday then at or above normal Wednesday through Saturday. Wind.. Brisk west winds today diminish to cal tonight through tomorrow afternoon then become light easterly tomorrow evening increasing to brisk-strong SE near noon on Sunday diminishing later in the day. Hazards.. Wet driving conditions beginning tomorrow evening. Sig rain event for Saturday night into Sunday. Possible bridge restrictions Sunday morning-afternoon. Watches/warnings.. Special weather statement in effect for Saturday night-Sunday for possible heavy rain. Flurries possible today and tomorrow across PEI..
Thursday, October 25th 8:20am... A low pressure system developed in the Bay of Fundy yesterday and approached southern NS which resulted in the rain at times heavy across the Maritimes. Even a few thundershowers accompanied this system. The system has moved slowly northward and ins now located in the southern Gulf of St Lawrence just north of Kings county and will continue to drift northward to be located near Anticosti Island by late this afternoon. Brisk-strong-NW winds will develop in the wake of this system today allowing cool air to flood in from the north. Any left over showers will change over to flurries in this cooler air. A ridge of high pressure will then begin to approach from the west and is expected to crest over the island Saturday afternoon. All eyes then shift to the south as the remnants of tropical system Willa. This system is now located along the Texas coast and will drift eastward today redeveloping off the east coast near Cape Hatteras early Saturday morning. The system will then intensify and track northward as a noreaster moving along the coast to be located on the Gulf of Maine by Sunday afternoon then continue northward moving inland through Maine and weakening passing west of NB Sunday night. Heavy rain and strong winds will accompany this system. High pressure will briefly build in Monday Morning/afternoon allowing for some relief then another noreaster approaches from the SW spreading more rain and wind across the region Monday night into Tuesday morning. High pressure returns for Tuesday afternoon and Wednesday with sunshine. Clouds and rain approach on Thursday as a warm front approaches. Precipitation.. The stormy wet weather pattern continues… Showers will transition to flurries this morning and continue overnight into tomorrow in the cool West winds. The trend will be for dryer conditions tomorrow as the system pulls away and high pressure builds in. Saturday will be dry but increasing clouds with rain developing near midnight. Rain event expected on Sunday with the heaviest rains expected down east. Can’t give actual amounts yet but looks like rainfall warnings may be required. Left over showers on Monday as this system pulls away then rain redevelops Monday night into Tuesday morning as the 2nd noreaster approaches. Wednesday and Thursday should be cloudy with just a chance of showers. Wind.. Brisk west winds today and tomorrow dropping off to calm Saturday. Light easterlies develop Saturday evening increasing to brisk-strong Sunday. Hazards.. A shower or flurrie today and tomorrow. Rain event begins Saturday night and continues all day Sunday. Possible bridge restrictions on Sunday.